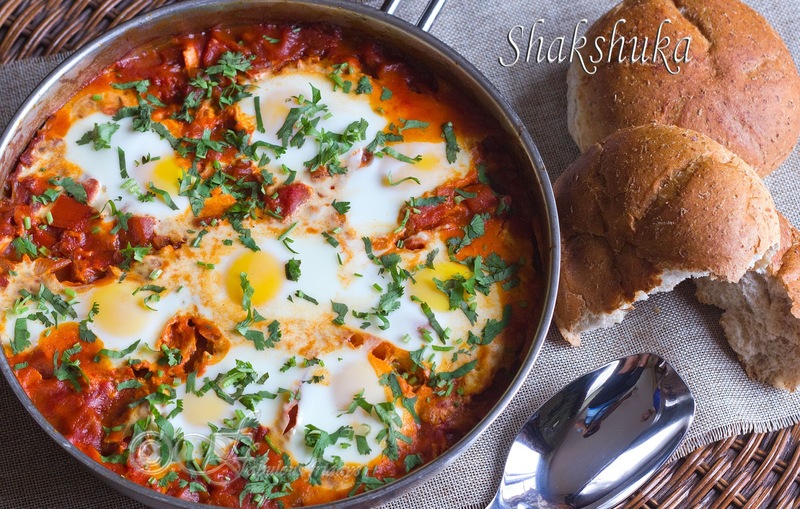 Shakshuka is a staple of Tunisian, Moroccan, and Egyptian cuisines, traditionally served for breakfast in a cast iron skillet or tagine. 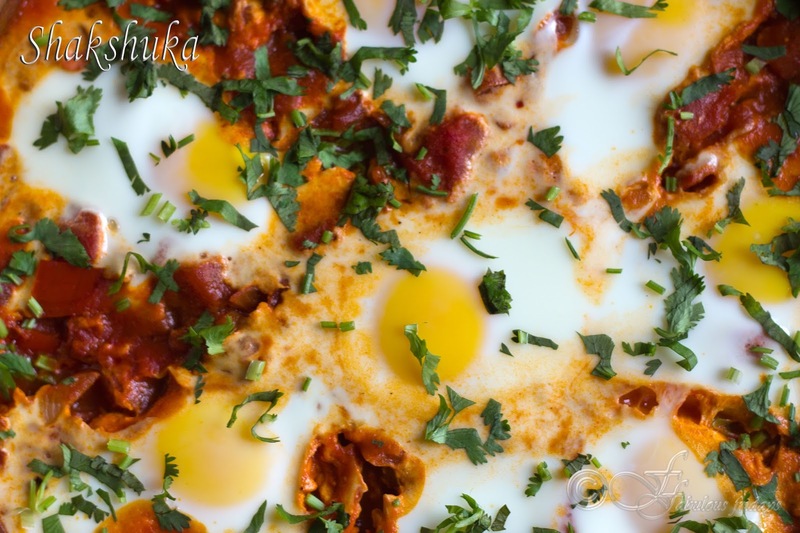 This one-pan dish is made of eggs baked in a tangy tomato, onion, and red pepper sauce, spiced with cumin and paprika. 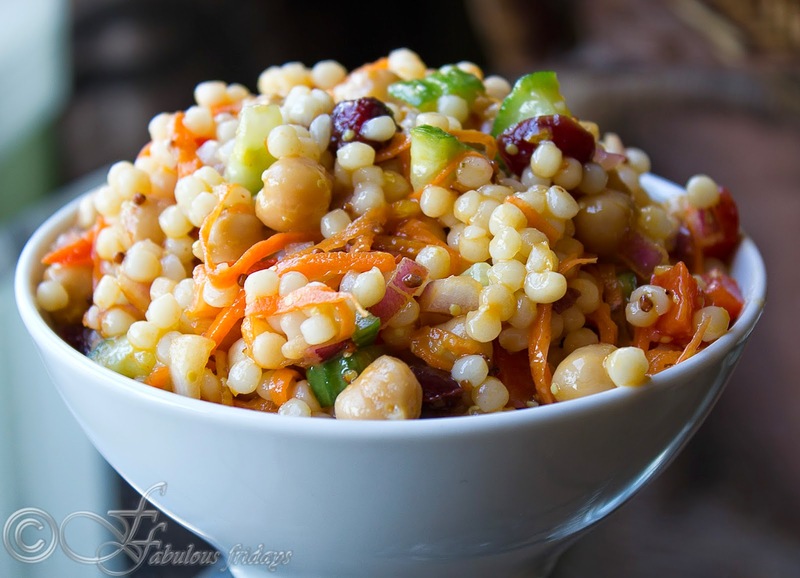 Serve it with a side of pita, challah or any rustic whole wheat bread (to mop up the sauce) for an excellent lunch /brunch meal. Cook the onions, pepper and tomato in a skillet on the stove. Once the sauce is all done, gently crack eggs on top of the sauce and bake it in the oven to finish cooking the eggs. 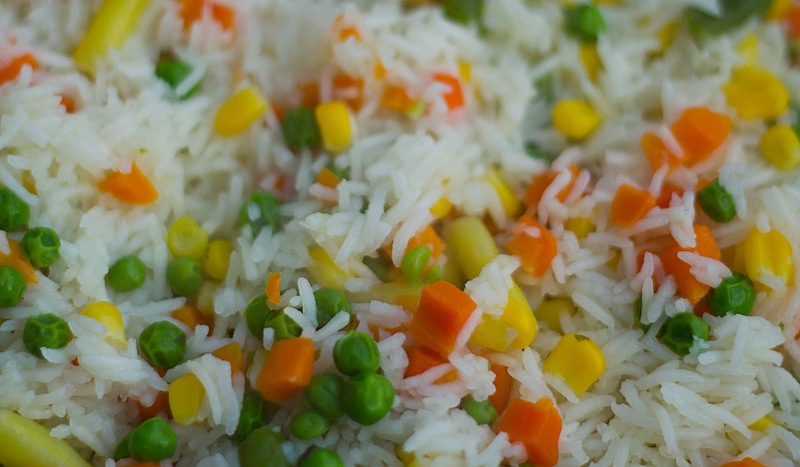 Like any great dish, there are several variations of this recipe. Here I have the more traditional version. But you can customize it to suit your palette by adding chopped spinach, sauteed mushrooms, or feta cheese. Heat oil in a large skillet over medium heat. Add onion, garlic and bell pepper and cook gently until soft, about 10 minutes. Stir in cumin, paprika, and cayenne, and add the tomatoes both chopped and tomato paste. Season with salt and pepper. Increase the heat to high till the mixture comes to a boil. Simmer and cook until tomatoes have thickened a bit, about 10 minutes. The sauce should not be too runny or too thick. Gently crack eggs over the hot tomato sauce. Season the eggs with salt and pepper. Transfer skillet to oven and bake until eggs are just set, 7-10 minutes. Sprinkle with cilantro and serve hot. Tandoori Chicken, a fave all over the world this succulent dish was created by Kundan lal Gujral in 1947 as a feature dish for his restaurant 'Moti Mahal' in Delhi, India. An instant hit tandoori chicken contributed significantly in putting India on the World's food map. Chicken is marinated in yogurt and spices and grilled in tandoor (a clay oven fired with wood or charcoal). 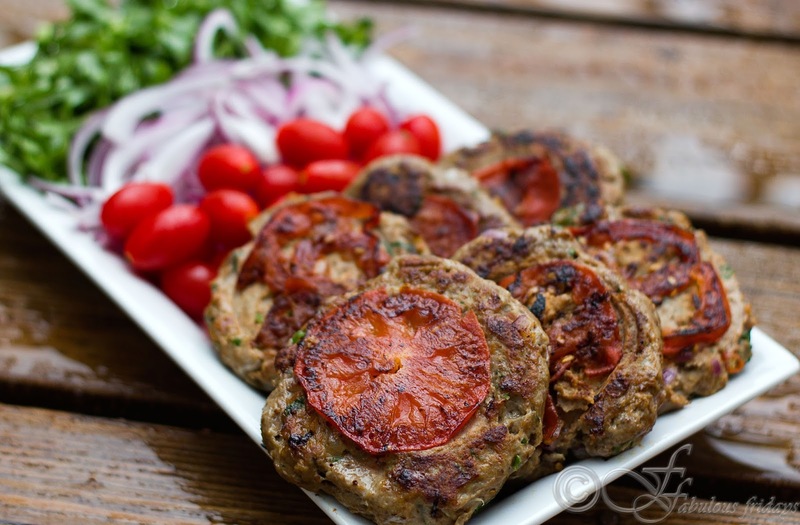 Its mostly served as an appetizer or a dinner accompaniment along with mint chutney and raw onions. 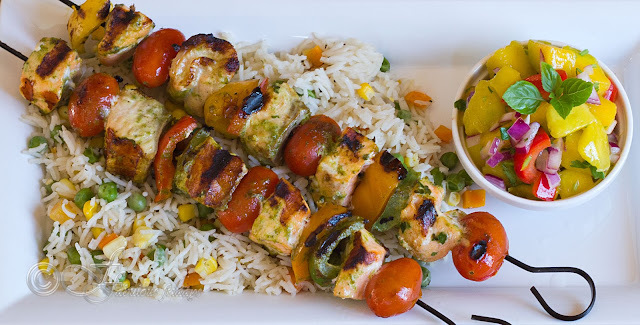 An interesting variation of this world famous dish is the tikka. Everything remains the same except you use boneless chicken and skewer these before cooking. 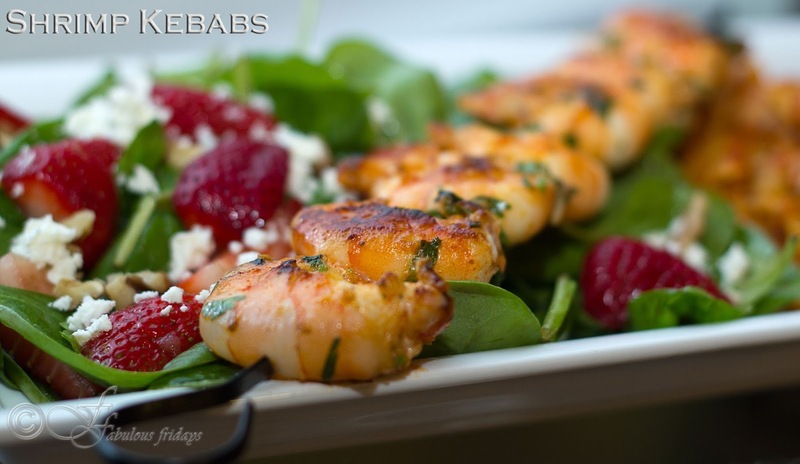 Serve with a wholesome salad for a summer time weekend dinner. Clean and dry the chicken thighs and cut into an inch and a half sized cubes. Make a mixture of salt and lime juice. Toss chicken cubes in this. Keep aside while you prepare the marinade. Marinade -- In a large bowl combine yogurt with all other ingredients including oil. Mix well and marinate the chicken in this mixture. Its best to use your hands so that you can work the marinade well all around. Cover and marinate the chicken overnight or a minimum of 6 hours in the fridge. Skewer these onto metal skewers or pre soaked wooden ones. Alternate chicken and onion chunks as you thread. Grill in the barbeque -- Preheat your BBQ to 375 F. Place the marinated chicken on the grill. Grill should be hot enough to make a sizzling sound when chicken is placed on it. Close the lid and cook for 15-18 minutes undisturbed. Open the grill and turn the chicken. You can baste it at this point with oil or butter. Cover again for 5-7 minutes. Check to ensure that chicken has cooked fully from inside. Remove from heat. Grill in the oven -- preheat your oven on grill at high setting (400-450 F) and place the rack on the top position. Prepare a grill pan with aluminum foil and grease the wire mesh on top. The pan underneath will catch all the drippings. Place the chicken on the wire mesh and grill on high undisturbed for 20 minutes. Take out he pan and turn the chicken and cook further for 7-10 minutes till the chicken is fully cooked and sizzling. This salad recipe makes for an excellent accompaniment to any BBQ dish. Use any beans you like - chickpeas, black beans or kidney beans. Can be eaten cold, warm or at room temperature. You can find the recipe here. 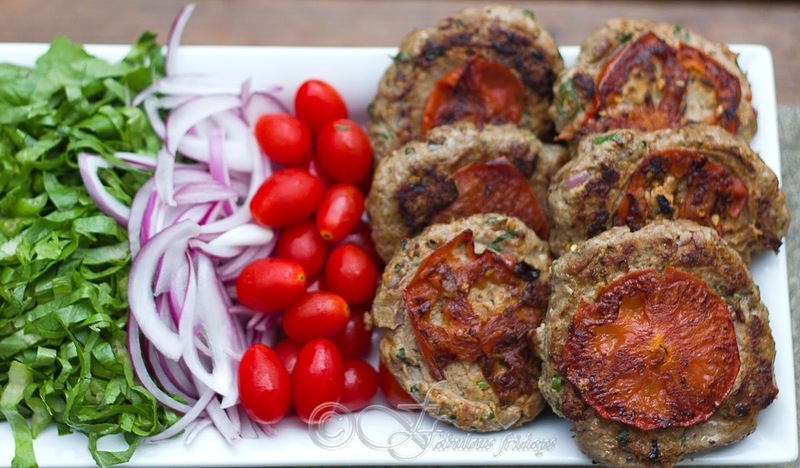 Peshawari chapli kebabs are soft and moist flat kebabs with a special flavor. This traditional dish of Pakistan uses simple spices and ingredients, and tastes awesome with some lime juice squeezed on top with a side of raita, salad and hot naans. One remove the pulp and keep aside, finely chop the remaining and mix in the mince. In this case be careful of the mixture consistency as tomatoes will leave some water. Refrigerate the shaped patties for half an hour(too long will make them more soggy) and then fry. Two, slice the tomatoes and press one slice into each patty and give it a flatter, more irregular shape like the authentic chapli kebab (as I made them). 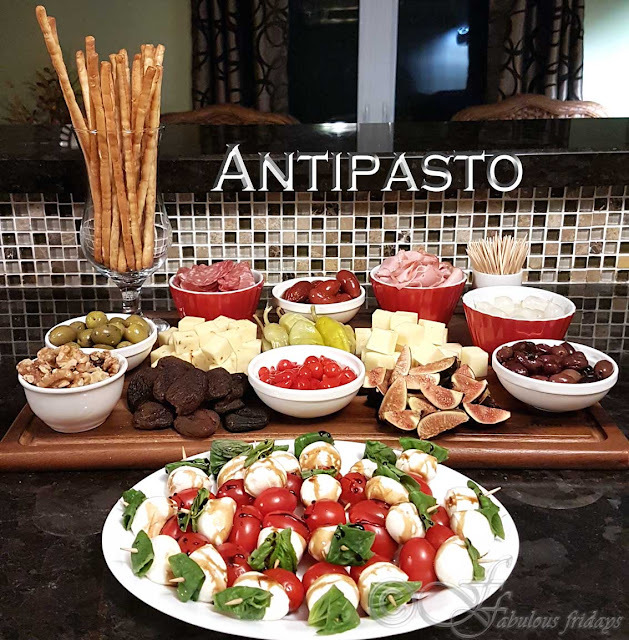 The second option is good for serving to guests as it looks beautiful. Either way they taste awesome. Eid mubarak to all those who are celebrating. Take all ingredients except tomatoes in a large bowl and mix well. If you are using option one (see above), then remove the tomato pulp and keep aside. Chop the tomato flesh fine and add to the mixture. If the mixture gets too wet, just add a little more chickpea flour. 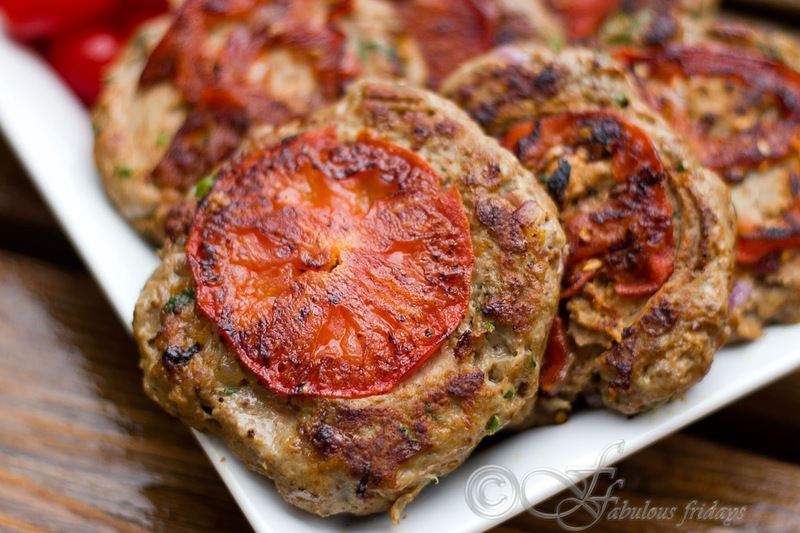 Refrigerate for about 30 minutes and then shape into flat round patties. If you are using option two, then thinly slice the tomatoes and keep aside. Refrigerate the mixture for 30 minutes, shape into flat round patties and press a slice of tomato onto each kebab as you flatten them. Shallow fry these in a non stick pan on medium high for 30-40 seconds and then lower the heat to medium low and continue cooking till they turn golden. Turn over and cook the other side till golden and cooked through. Try not to crowd the pan, cook only a few at a time. Drain excess oil in a paper towel and serve hot drizzled with lime juice, salad, naan and cucumber raita. 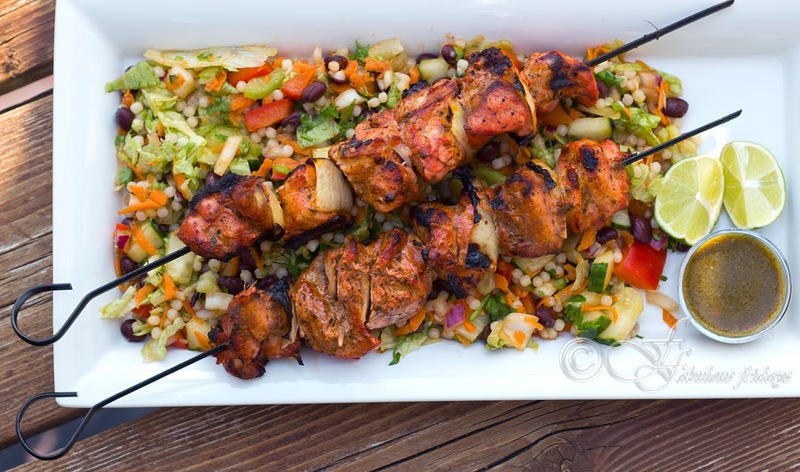 This delicious meal can be the star of your next summer BBQ. 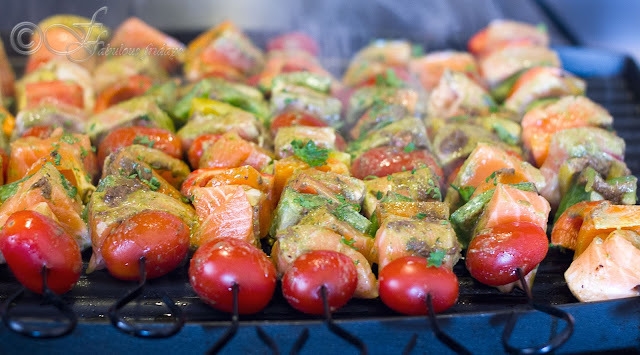 The firm meaty texture of salmon is perfect for kebabs with the added benefit of omega 3 fatty acids. Pair it with tomatoes, colorful peppers and mangoes; you get yourself a power house of nutrition and taste. 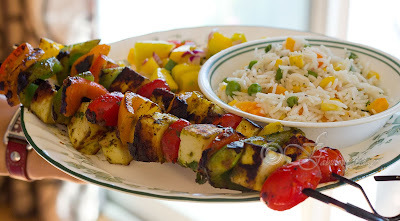 You can add other vegetables to the skewers like red onions, mushrooms, zucchini, etc. The side helping of mango salsa just gives a burst of summer flavor. Cut salmon into cubes, about 1 inches each. Cut the peppers into one inch chunks. In a blender, take all ingredients for the basil oil and puree until smooth. Reserve some for brushing later. Add the rest to salmon cubes and toss to coat well. Thread salmon against the grain on 8 skewers, alternating with tomatoes and peppers. Grill for 8 to 12 minutes, until fish is opaque, turning occasionally. 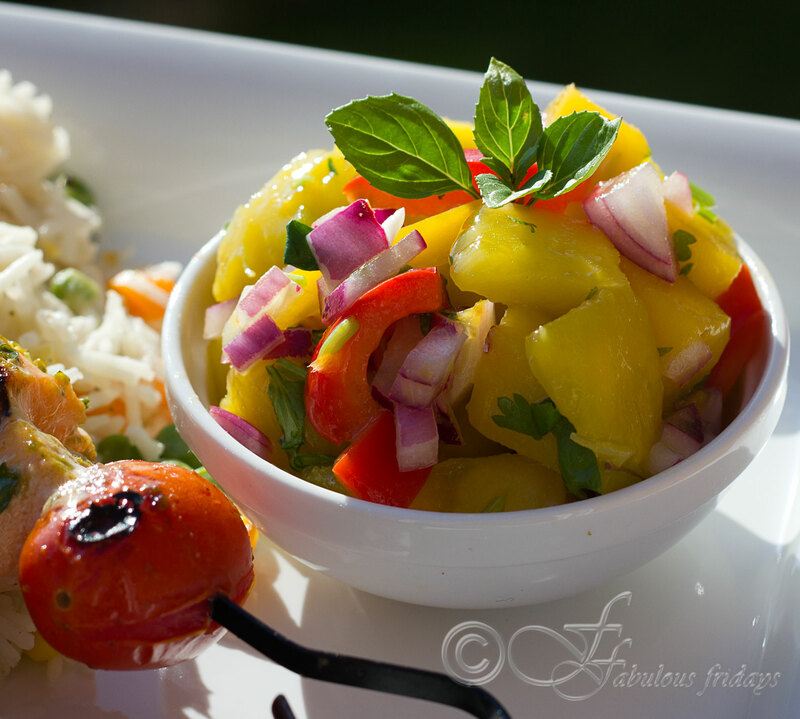 Serve hot on a bed of vegetable rice and a side of tangy spicy mango salsa. For Mango salsa, peel and chop 2 mangoes into bite sized pieces. Also dice 1/2 red onion, 1 red pepper, handful of fresh coriander and mint, a few green chilies. Toss them all together and dress with a couple teaspoons of sesame oil, a drizzle of lime juice, salt, freshly ground black pepper. Make this salsa ahead of time and chill for a minimum of 20 minutes to allow flavors to blend. Serve cold. This makes for a wonderful accompaniment with any grilled fish or meat dish. For a vegetarian option, substitute salmon with paneer or tofu. Here is the vegetarian version I made with paneer. Follow the same recipe, just adjust the cooking time and temperature.